King is an advocate for gender equality and has long been a pioneer for equality and social justice. In 1973, at age 29, she won the "Battle of the Sexes" tennis match against the 55-year-old Bobby Riggs. She was also the founder of the Women's Tennis Association and the Women's Sports Foundation. She was also instrumental in persuading cigarette brand Virginia Slims to sponsor women's tennis in the 1970s and went on to serve on the board of their parent company Philip Morris in the 2000s. Regarded by many in the sport as one of the greatest tennis players of all time, King was inducted into the International Tennis Hall of Fame in 1987. The Fed Cup Award of Excellence was bestowed on her in 2010. In 1972, she was the joint winner, with John Wooden, of the Sports Illustrated Sportsman of the Year award and was one of the Time Persons of the Year in 1975. She has also received the Presidential Medal of Freedom and the Sunday Times Sportswoman of the Year lifetime achievement award. She was inducted into the National Women's Hall of Fame in 1990, and in 2006, the USTA National Tennis Center in New York City was renamed the USTA Billie Jean King National Tennis Center. In 2018, she won the BBC Sports Personality of the Year Lifetime Achievement Award. Billie Jean Moffitt was born in Long Beach, California, into a conservative Methodist family, the daughter of Betty (née Jerman), a housewife, and Bill Moffitt, a firefighter. Her family was athletic; her mother excelled at swimming, her father played basketball, baseball and ran track. Her younger brother, Randy Moffitt, became a Major League Baseball pitcher, pitching for 12 years in the major leagues for the San Francisco Giants, Houston Astros, and Toronto Blue Jays. She also excelled at baseball and softball as a child, playing shortstop at 10 years old on a team with girls 4–5 years older than her. The team went on to win the Long Beach softball championship. She switched from softball to tennis at age 11, because her parents suggested she should find a more ladylike sport. She saved her own money – $8 – to buy her first racket. She learned tennis on the many free public courts in Long Beach, taking advantage of the free lessons tennis professional Clyde Walker offered at those courts. One of the city's tennis facilities has subsequently been named the Billie Jean Moffitt King Tennis Center. As a kid playing in her first tennis tournaments, she was often hindered by her aggressive playing style. Bob Martin, sportswriter for the Long Beach, Press-Telegram wrote about her success in a weekly tennis column. She attended Long Beach Polytechnic High School. After graduating, she attended California State University, Los Angeles (Cal State LA). She did not graduate, leaving school in 1964 to focus on tennis. :25 While attending Cal State, she met Larry King in a library. The pair became engaged while still in school when Billie Jean was 20 and Larry 19 years old and married on September 17, 1965 in Long Beach. King's triumph at the French Open in 1972 made her only the fifth woman in tennis history to win the singles titles at all four Grand Slam events, a "career Grand Slam. "[a] She also won a career Grand Slam in mixed doubles. In women's doubles, only the Australian Open eluded her. King played 51 Grand Slam singles events from 1959 through 1983, reaching at least the semifinals in 27 and at least the quarterfinals in 40 of her attempts. King was the runner-up in six Grand Slam singles events. An indicator of her mental toughness in Grand Slam singles tournaments was her 11–2 career record in deuce third sets, i.e., third sets that were tied 5–5 before being resolved. In Federation Cup finals, she was on the winning United States team seven times, in 1963, 1966, 1967, and 1976 through 1979. Her career win–loss record was 52–4. [c] She won the last 30 matches she played,[d] including 15 straight wins in both singles and doubles. In Wightman Cup competition, her career win–loss record was 22–4,[e] winning her last nine matches. [f] The United States won the cup ten of the 11 years that she participated. In singles, King was 6–1 against Ann Haydon-Jones, 4–0 against Virginia Wade, and 1–1 against Christine Truman Janes. In 1964, King won four relatively minor titles but lost to Margaret Court in the Wimbledon semifinals. She defeated Ann Haydon-Jones at both the Wightman Cup and Fed Cup but lost to Court in the final of the Federation Cup. At the U.S. Championships, fifth-seeded Nancy Richey Gunter upset third-seeded King in the quarterfinals. Late in the year, King decided to make a full-time commitment to tennis. While a history major at Los Angeles State College King made the decision to play full-time when businessman Robert Mitchell, offered to pay her way to Australia so that she could train under the great Australian coach Mervyn Rose. While in Australia, King played three tournaments that year and lost in the quarterfinals of the Queensland Grass Court Championships, the final of the New South Wales Championships (to Court), and the third round of the Victorian Championships. In early 1965, King continued her three-month tour of Australia. She lost in the final of the South Australian Championships and the first round of the Western Australia Championships. At the Fed Cup in Melbourne, she defeated Ann Haydon-Jones to help the United States defeat the United Kingdom in the second round. However, Margaret Court again defeated her in the final. At the Australian Championships two weeks later, she lost to Court in the semifinals in two sets. At Wimbledon, she again lost in the semifinals, this time in three sets to Maria Bueno. Her last tournament of the year was the U.S. Championships, where she defeated Jones in the quarterfinals and Bueno in the semifinals. In the final, King led 5–3 in both sets, was two points from winning the first set, and had two set points in the second set before losing to Court in straight sets. She said that losing while being so close to winning was devastating, but the match proved to her that she was "good enough to be the best in the world. I'm going to win Wimbledon next year." She won six tournaments during the year. For the first time in 81 years, the annual convention of the United States Lawn Tennis Association overruled its ranking committee's recommendation to award her the sole U.S. No. 1 position and voted 59,810 to 40,966 to rank Nancy Richey Gunter and King as co-U.S. No. 1. Six of King's Grand Slam singles titles were at Wimbledon, four were at the U.S. Championships/Open, one was at the French Open, and one was at the Australian Championships. King reached the final of a Grand Slam singles tournament in 16 out of 25 attempts and had a 12–4 win–loss record in those finals. In the nine tournaments that she failed to reach the final, she was a losing semifinalist twice and a losing quarter finalist five times. From 1971 through 1975, she won seven of the ten Grand Slam singles tournaments she played. She won the last seven Grand Slam singles finals she contested, six of them in straight sets and four of them against Evonne Goolagong. All but one of her Grand Slam singles titles were on grass. King successfully defended her title at the South African Tennis Championships in 1967, defeating Maria Bueno in the final. She played the French Championships for the first time in her career, falling in the quarterfinals to Annette Van Zyl DuPlooy of South Africa. At the Federation Cup one week later in West Germany on clay, King won all four of her matches, including victories over DuPlooy, Ann Haydon-Jones, and Helga Niessen Masthoff. King then successfully switched surfaces and won her second consecutive Wimbledon singles title, defeating Virginia Wade in the quarterfinals 7–5, 6–2 and Jones. At the Wightman Cup, King again defeated Wade and Jones. King won her second Grand Slam singles title of the year when she won the U.S. Championships for the first time and without losing a set, defeating Wade, DuPlooy, Françoise Dürr, and Jones in consecutive matches. Jones pulled her left hamstring muscle early in the final and saved four match points in the second set before King prevailed. King won the singles, women's doubles, and mixed doubles titles at both Wimbledon and the U.S. Championships, the first woman to do that since Alice Marble in 1939. King then returned to the Australian summer tour in December for the first time since 1965, playing seven events there and Judy Tegart-Dalton in six of those events (winning four of their matches). King lost in the quarterfinals of the New South Wales Championships in Sydney to Dalton after King injured her left knee in the second game of the third set of that match. However, King won the Victorian Championships in Melbourne the following week, defeating Dalton, Reid, and Lesley Turner Bowrey in the last three rounds. At a team event in Adelaide, King won all three of her singles and doubles matches to help the U.S. defeat Australia 5–1. To finish the year, King lost to Dalton in the final of the South Australian Championships in Adelaide. In early 1968, King won three consecutive tournaments to end her Australian tour. In Perth, King won the Western Australia Championships, defeating Margaret Court in the final. In Hobart, King won the Tasmanian Championships by defeating Judy Tegart-Dalton in the final. King then won the Australian Championships for the first time, defeating Dalton in the semifinals and Court in the final. King continued to win tournaments upon her return to the United States, winning three indoor tournaments before Nancy Richey Gunter defeated King in the semifinals of the Madison Square Garden Challenge Trophy amateur tournament in New York City before 10,233 spectators. The match started with Gunter taking a 4–2 lead in the first set, before King won 9 of the next 10 games. King served for the match at 5–1 and had a match point at 5–3 in the second set; however, she lost the final 12 games and the match 4–6, 7–5, 6–0. King then won three consecutive tournaments in Europe before losing to Ann Haydon-Jones in the final of a professional tournament at Madison Square Garden. Playing the French Open for only the second time in her career and attempting to win four consecutive Grand Slam singles titles (a "non-calendar year Grand Slam"), King defeated Maria Bueno in a quarterfinal before losing to Gunter in a semifinal 2–6, 6–3, 6–4. King rebounded to win her third consecutive Wimbledon singles title, defeating Jones in the semifinals and Dalton in the final. At the US Open, King defeated Bueno in a semifinal before being upset in the final by Virginia Wade. On September 24, she had surgery to repair cartilage in her left knee and did not play in tournaments the remainder of the year. King said that it took eight months (May 1969) for her knee to recover completely from the surgery. In 1977, King said that her doctors predicted in 1968 that her left knee would allow her to play competitive tennis for only two more years. In 1970, Margaret Court won all four Grand Slam singles tournaments and was clearly the World No. 1. King lost to Court three times in the first four months of the year, in Philadelphia, Dallas, and Johannesburg (at the South African Open). Court, however, was not totally dominant during this period as King defeated her in Sydney and Durban, South Africa. Where Court dominated was at the Grand Slam tournaments. King did not play the Australian Open. King had leg cramps and lost to Helga Niessen Masthoff of West Germany in the quarterfinals of the French Open 2–6, 8–6, 6–1. At Wimbledon, Court needed seven match points to defeat King in the final 14–12, 11–9 in one of the greatest women's finals in the history of the tournament. On July 22, King had right knee surgery, which forced her to miss the US Open. King returned to the tour in September, where she had a first round loss at the Virginia Slims Invitational in Houston and a semifinal loss at the Pacific Coast Championships in Berkeley, California. To close out the year, King in November won the Virginia Slims Invitational in Richmond, Virginia and the Embassy Indoor Tennis Championships in London. During the European clay court season, King warmed-up for the French Open by playing in Monte Carlo (losing in the semifinals), winning the Italian Open (saving three match points against Virginia Wade in the semifinals), playing in Bournemouth (losing to Wade in the quarterfinals), and playing in Berlin (losing to Masthoff in the semifinals). The Italian Open victory was the first important clay court title of King's career. Along the way, she defeated Masthoff in a three-set quarterfinal and Wade in a three-set semifinal, saving two match points at 4–5 in the second set. The twelfth game of that set (with King leading 6–5) had 21 deuces and lasted 22 minutes, with Wade saving seven set points and holding sixteen game points before King won. In Wightman Cup competition two weeks before Wimbledon but played at the All England Club, King defeated both Wade and Ann Haydon-Jones in straight sets. 1973 was Margaret Court's turn to win three Grand Slam singles titles, failing to win only Wimbledon, and was the clear World No. 1 for the year; this was her first full season since winning the Grand Slam in 1970, as she had missed significant portions of 1971 and 1972 due to childbirth. As during the previous year, King started 1973 inconsistently. She missed the first three Virginia Slims tournaments in January because of a wrist injury. She then lost in the third round at the Virginia Slims of Miami tournament but won the Virginia Slims of Indianapolis tournament, defeating Court in the semifinals 6–7, 7–6, 6–3 and Rosemary Casals in the final. The semifinal victory ended Court's 12-tournament and 59-match winning streaks, with King saving at least three match points when down 5–4 (40–0) in the second set. Indianapolis was followed by five tournaments that King failed to win (Detroit, Boston, Chicago, Jacksonville, and the inaugural Family Circle Cup in Hilton Head, South Carolina). King lost to Court in two of those tournaments. After deciding not to defend her French Open singles title, King won four consecutive tournaments, including her fifth Wimbledon singles title when she defeated Kerry Melville Reid in the quarterfinals, Evonne Goolagong in the semifinals on her eighth match point, and Chris Evert in the final. King lost only nine points in the 6–0 bageling of Evert in the first set of their final. King also completed the Triple Crown at Wimbledon (winning the singles, women's doubles, and mixed doubles titles in the same year), thus becoming the first, and only, player to do so at Wimbledon in the Open Era. In none of the preceding tournaments, however, did King play Court. Their rivalry resumed in the final of the Virginia Slims of Nashville tournament, where Court won for the third time in four matches against King in 1973. (This was the last ever singles match between those players, with Court winning 21 and King 13 of their 34 matches.) Three weeks later at the US Open, King retired from her fourth-round match with Julie Heldman while ill and suffering from the oppressive heat and humidity. When Heldman complained to the match umpire that King was taking too long between games, King reportedly told Heldman, "If you want the match that badly, you can have it!" The Battle of the Sexes match against Bobby Riggs was held in the middle of the Virginia Slims of Houston tournament. King won her first and second round matches three days before playing Riggs, defeated Riggs, won her quarterfinal match the day after the Riggs match, and then lost the following day to Casals in the semifinals 7–6, 6–1. According to King, "I had nothing left to give." To end the year, King won tournaments in Phoenix, Hawaii, and Tokyo and was the runner-up in Baltimore. Riggs had been a top men's player in the 1930s and 1940s in both the amateur and professional ranks. He won the Wimbledon men's singles title in 1939, and was considered the World No. 1 male tennis player for 1941, 1946, and 1947. He then became a self-described tennis "hustler" who played in promotional challenge matches. Claiming that the women's game was so inferior to the men's game that even a 55-year-old like himself could beat the current top female players, he challenged and defeated Margaret Court 6–2, 6–1. King, who previously had rejected challenges from Riggs, then accepted a lucrative financial offer to play him for $100,000, winner-take-all. Dubbed "the Battle of the Sexes", the Riggs-King match took place at the Houston Astrodome in Texas on September 20, 1973. The match garnered huge publicity. In front of 30,492 spectators and a television audience estimated at 50 million people (U.S.), and 90 million in 37 countries, 29-year-old King beat the 55-year-old Riggs 6–4, 6–3, 6–3. The match is considered a very significant event in developing greater recognition and respect for women's tennis. King said, "I thought it would set us back 50 years if I didn't win that match. It would ruin the women's [tennis] tour and affect all women's self-esteem," and that "To beat a 55-year-old guy was no thrill for me. The thrill was exposing a lot of new people to tennis." King played only one of the Wimbledon warm-up tournaments, defeating Olga Morozova in the Eastbourne semifinals before losing to Wade in the final. Seeded third at Wimbledon, King defeated seventh seeded Morozova in the quarterfinals (6–3, 6–3) and then top seeded Evert in the semifinals (2–6, 6–2, 6–3) after being down 3–0 (40–15) in the final set. Evert blamed her semifinal defeat on a loss of concentration when she saw Jimmy Connors, her former fiancé, escorting Susan George into Centre Court. King, however, believes that the match turned around because King planned for and totally prepared for Wimbledon that year and told herself when she was on the verge of defeat, "Hey, Billie Jean, this is ridiculous. You paid the price. For once, you looked ahead. You're supposed to win. Get your bahoola in gear." King then defeated fourth seeded Goolagong Cawley in the second most lopsided women's final ever at Wimbledon (6–0, 6–1). King called her performance a "near perfect match" and said to the news media, "I'm never coming back." At Wimbledon in the third round, King played Maria Bueno for the last time, with King winning 6–2, 7–5. In the quarterfinals, Evert defeated King for the first time at a Grand Slam singles tournament and for the first time on grass 6–1, 6–2 in just 46 minutes. Evert said it was the best match she had ever played on grass up to that point in her career, and King said, "No excuses. Let's forget knees, ankles, toes, everything else. She just played beautiful tennis. I don't think many players would've beaten her today." King also said after the match, "Maybe I can be happy being number eight instead of number one. At this stage, just playing, that's winning enough for me." But when asked about retirement, King said, "Retire? Quit tournament tennis? You gotta be kidding. It just means I've got a lot more work. I've got to make myself match tough ... mentally as well as physically. I gotta go out and kill myself for the next six months. It's a long, arduous process. I will suffer. But I will be back." There was a small historic note at Wimbledon 1977 in that it was the first time ever that King competed at the championships that she did not reach a final. From her debut in 1961 until 1976, she had played in the final of one of the three championship events for women every year. Perhaps there was irony in this in that as the Wimbledon champion with the most titles in its history, the event was celebrating its centenary in the year King failed to make a final for the first time. The only other years she competed at the championship and did not feature in a final were 1980 and 1982. In her entire Wimbledon career of 22 competitions, King never failed to be a semi-finalist in at least one event every year. King played the 1980 French Open, her first time since she won the event in 1972 and completed a career singles Grand Slam. She was seeded second but lost in the quarterfinals to fifth-seeded Dianne Fromholtz Balestrat of Australia. At Wimbledon, King defeated Pam Shriver in a two-hour, forty minute fourth round match after King saved a match point in the second set and recovered from a 4–2 (40–0) deficit in the third set with Shriver serving. In a quarterfinal that took two days to complete, King lost to two-time defending champion and top-seeded Navratilova 7–6, 1–6, 10–8. The beginning of the match was delayed until late afternoon because of rain. Because she wore glasses, King agreed to start the match then on condition that tournament officials immediately suspend the match if the rain resumed. During the first set, drizzle began to fall; however, the chair umpire refused to suspend the match. King led in the tiebreaker 5–1 before Navratilova came back to win the set, whereupon the umpire then agreed to the suspension. When the match resumed the next day, King won 20 of the first 23 points to take a 5–0 lead in the second set and lost a total of seven points while winning the set in just 17 minutes. In the third set, Navratilova broke serve to take a 2–0 lead before King broke back twice and eventually served for the match at 6–5. King then hit four volley errors, enabling Navratilova to break serve at love and even the match. King saved three match points while serving at 6–7 and three more match points while serving at 7–8. During the change-over between games at 8–9, King's glasses broke for the first time in her career. She had a spare pair, but they did not feel the same. King saved two match points before Navratilova broke serve to win the match. King said, "I think that may be the single match in my career that I could have won if I hadn't had bad eyes." King became the oldest WTA player to win a singles tournament when she won the Edgbaston Cup grass court tournament in Birmingham at 39 years, 7 months and 23 days after a straight-sets victory in the final against Alycia Moulton. The final official singles match of King's career was a second round loss to Catherine Tanvier at the 1983 Australian Open. King and her then-husband Larry co-founded World Team Tennis in 1974. The couple used their savings to put on a team tennis event at the Oakland Coliseum. King remained involved with World Team Tennis for decades, eventually sharing ownership with her ex-husband, her life partner Ilana Kloss and USTA. Billie Jean was selected to deliver the Northwestern University commencement address on June 16, 2017 in Evanston, Illinois. She attended the 75th Golden Globe Awards in 2018 as a guest of Emma Stone. King and Kloss became minority owners of the Los Angeles Dodgers baseball team in September 2018. King received the BBC Sports Personality of the Year Lifetime Achievement Award on December 16, 2018. It was presented to by long-time friend and fellow tennis player and broadcaster Sue Barker, making King only the second American (after Michael Phelps) and the first American woman to win the award. King's friend Elton John wrote the song "Philadelphia Freedom", a nod to her World TeamTennis team, for King. The song was released new year's day 1975 and became a number one hit. Charles M. Schulz, creator of the Peanuts comic strip, was an admirer and close friend. Schulz referred to King several times in Peanuts and used the comic strip to support the women's sports movement after becoming friends with King. Actress Holly Hunter portrayed King in the 2001 ABC television film When Billie Beat Bobby. King played a judge on Law & Order in 2007, and appeared as herself on The Odd Couple in 1973, Ugly Betty in May 2009, and Fresh Off The Boat in 2016. Actress Emma Stone portrayed King in the 2017 biopic Battle of the Sexes. 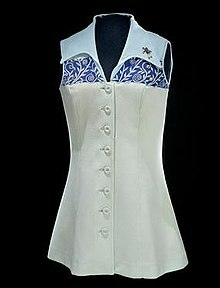 The Ted Tinling designed dress King wore for the real Battle of the Sexes match is part of a Smithsonian Museum collection. Billie Jean and Larry King were engaged in fall of 1964 and married in Long Beach, California, on September 17, 1965. Billie Jean credited Larry with introducing her to feminism and for pushing her to pursue tennis as a career. Billie Jean later said she "was totally in love with Larry" when they married. By 1968, King realized that she was attracted to women, and in 1971, began an intimate relationship with her secretary, Marilyn Barnett (born Marilyn Kathryn McRae on January 28, 1948). Billie Jean acknowledged the relationship when it became public in a May 1981 palimony lawsuit filed by Barnett, making Billie Jean the first prominent professional female to come out. Feeling she could not admit to the extent of the relationship, Billie Jean publicly called it a fling and a mistake. She remained married to Larry. The lawsuit caused Billie Jean to lose an estimated $2 million in endorsements and forced her to prolong her tennis career to pay attorneys. Also in 1971, she had an abortion that was made public in a Ms. magazine article. Larry had revealed Billie Jean's abortion without consulting her. I wanted to tell the truth but my parents were homophobic and I was in the closet. As well as that, I had people tell me that if I talked about what I was going through, it would be the end of the women's tour. I couldn't get a closet deep enough. One of my big goals was always to be honest with my parents and I couldn't be for a long time. I tried to bring up the subject but felt I couldn't. My mother would say, "We're not talking about things like that", and I was pretty easily stopped because I was reluctant anyway. I ended up with an eating disorder that came from trying to numb myself from my feelings. I needed to surrender far sooner than I did. At the age of 51, I was finally able to talk about it properly with my parents and no longer did I have to measure my words with them. That was a turning point for me as it meant I didn't have regrets any more. Billie Jean and Larry remained married through the palimony suit fallout. The marriage ended in 1987 after Billie Jean fell in love with her doubles partner, Ilana Kloss. Billie Jean and Larry remained on good terms, with Billie Jean serving as godmother to Larry's son from his subsequent marriage. Billie Jean King has residences in New York City and Chicago with Kloss, her life partner. ^ Five additional women have completed a career Grand Slam since King. ^ Martina Navratilova also has 20 career titles at Wimbledon. ^ a b "Women's Tennis Association biography of Billie Jean King". Sonyericssonwtatour.com. Archived from the original on July 5, 2009. Retrieved July 4, 2011. ^ King, Billie Jean. "Billie Jean King – Speaker – TED". ^ Jason Le Miere (August 28, 2015). "Top 10 Women's Tennis Players Of All-Time: Where Does Serena Williams Rank On List Of Greatest Ever?". International Business Times. Retrieved January 30, 2017. ^ "Serena Williams: Is she your greatest female player of the Open era?". BBC Sport. January 28, 2017. Retrieved January 30, 2017. ^ a b c d e "International Tennis Hall of Fame biography of Billie Jean Moffitt King". Archived from the original on November 19, 2006. Retrieved February 15, 2007. ^ a b "Official Wimbledon profile of Billie Jean King". Archived from the original on February 25, 2007. Retrieved February 15, 2007. ^ "King, Billie Jean (1943—) – Women in World History: A Biographical Encyclopedia". Encyclopedia.com. Retrieved June 29, 2014. ^ a b c d e f g h i j k l m n Higdon, Hal (August 23, 2013). "Plays Tennis Like a Man, Speaks Out Like — Billie Jean King". The New York Times. ISSN 0362-4331. Retrieved September 16, 2017. ^ "Randy Moffitt Statistics". Retrieved February 15, 2007. ^ Randy Moffitt Stats. Baseball-Reference.com. Retrieved on May 20, 2018. ^ a b "King, Billie Jean – National Women's Hall of Fame". National Women's Hall of Fame. Retrieved September 15, 2017. ^ "Billie Jean King Moffitt Tennis Center". Archived from the original on August 29, 2017. Retrieved August 26, 2017. ^ "Press Release – King's Schools". Archived from the original on December 24, 2006. Retrieved February 15, 2007. ^ Ware, Susuan (2011). "Game, Set, Match: Billie Jean King and the Revolution in Women's Sports". www.questia.com. Retrieved October 1, 2017. ^ a b c d e f g Hingston, Sandy (June 17, 2011). "Billie Jean King: Racquet Revolutionary – Page 4 of 5 – Philadelphia Magazine". Philadelphia Magazine. Retrieved September 30, 2017. ^ Nelson, Murry R. (May 23, 2013). American Sports: A History of Icons, Idols, and Ideas [4 Volumes]: A History of Icons, Idols, and Ideas. ABC-CLIO. p. 665. ISBN 0313397538. ^ "Billie Jean King: Overview". Women's Tennis Association. Retrieved August 26, 2017. ^ Hollander, Zander; Collins, Bud (1994). Bud Collins' Modern Encyclopedia of Tennis. Detroit, Michigan: Visible Ink Press. pp. 580–1. ISBN 0-8103-9443-X. ^ a b "Billie Jean King". 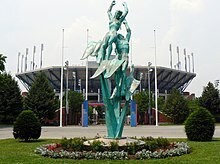 International Tennis Hall of Fame. Retrieved September 15, 2017. ^ Nelson, Kathleen (July 3, 2011). "Three aces for Tennis". stltoday.com. Retrieved September 24, 2017. ^ Bollinger, Michele; Tran, Dao (November 6, 2012). 101 Changemakers: Rebels and Radicals Who Changed U.S. History. Haymarket Books. ISBN 9781608461561. ^ Talbert, William F. (February 16, 1959). "New Hopes are Abounding on the Courts". SI.com. Retrieved October 8, 2017. ^ Hingston, Sandy (June 17, 2011). "Billie Jean King: Racquet Revolutionary – Page 4 of 5 – Philadelphia Magazine". Philadelphia Magazine. Retrieved September 27, 2017. ^ a b c d e Ware, Susan (2011). "Game, Set, Match: Billie Jean King and the Revolution in Women's Sports". www.questia.com. Retrieved October 1, 2017. ^ Collins, Bud (1989). My Life With the Pros. New York: E. P. Dutton. p. 261. ISBN 0-525-24659-2. ^ Starr, Cynthia; King, Billie Jean (1988). We Have Come a Long Way: The Story of Women's Tennis. New York: McGraw-Hill. p. 106. ISBN 0-07-034625-9. ^ Lovesey, John (July 13, 1964). "The Outcasts are Counted In". SI.com. Retrieved October 15, 2017. ^ Starr, Cynthia; King, Billie Jean (1988). We Have Come a Long Way: The Story of Women's Tennis. New York: McGraw-Hill. pp. 113–4. ISBN 0-07-034625-9. ^ a b Starr, Cynthia; King, Billie Jean (1988). We Have Come a Long Way: The Story of Women's Tennis. New York: McGraw-Hill. p. 114. ISBN 0-07-034625-9. ^ Lovesey, John (July 11, 1966). "Manolo is king, and a King is queen". Vault.sportsillustrated.cnn.com. Archived from the original on December 9, 2008. Retrieved July 4, 2011. ^ "News Archive; 1966: Tennis". News.elementfx.com. Archived from the original on March 3, 2016. Retrieved July 4, 2011. ^ King claims that the United States Lawn Tennis Association prohibited her from playing the French Championships earlier in her career because the association needed her to play grass court tournaments in the United States to draw crowds. Starr, Cynthia; King, Billie Jean (1988). We Have Come a Long Way: The Story of Women's Tennis. New York: McGraw-Hill. p. 114. ISBN 0-07-034625-9. ^ "News Archive; 1967: Tennis". News.elementfx.com. Archived from the original on March 3, 2016. Retrieved July 4, 2011. ^ Anderson, Dave (March 30, 1968). "Miss Richey Upsets Mrs. King, 4–6, 7–5, 6–0, to Gain Garden Tennis Final". The New York Times. Retrieved July 4, 2011. ^ "News Archive; 1968: Tennis". News.elementfx.com. Archived from the original on March 4, 2016. Retrieved July 4, 2011. ^ "Mrs. King Undergoes Successful Surgery". The New York Times. June 3, 2011. Retrieved July 4, 2011. ^ "Surgery for Billie Jean". Independent Press-Telegram. Long Beach, California. July 11, 1970. p. C-1. ^ "King Will Resume Singles Competition". The Pocono Record. Stroudsburg, Pennsylvania. January 20, 1977. p. 14. ^ Katz, Michael (June 4, 1970). "Mrs. King, Hobbled by Leg Cramps, Loses to Miss Niessen in French Tennis". The New York Times. Retrieved July 4, 2011. ^ "Classic women's singles finals". BBC News. June 11, 2000. Retrieved July 4, 2011. ^ Tingay, Lance (1983). The Guinness Book of Tennis Facts & Feats. Enfield, Middlesex: Guinness Superlatives. p. 26. ISBN 0-85112-268-X. ^ "Tennis Pro Favors Abortion", Tucson (Arizona) Daily-Citizen, February 23, 1972, page 16. ^ Deford, Frank; King, Billie Jean (1982). Billie Jean. New York, N.Y.: Viking. p. 20. ISBN 0-670-47843-1. ^ Deford, Frank; King, Billie Jean (1982). Billie Jean. New York, N.Y.: Viking. p. 93. ISBN 0-670-47843-1. ^ After winning the French Open in 1972, King stayed away from the tournament for seven consecutive years and, in fact, played the tournament only twice more during her career, in 1980 and 1982. ^ Jares, Joe (July 16, 1973). "A Bloomin' Winner". Vault.sportsillustrated.cnn.com. Archived from the original on June 25, 2009. Retrieved July 4, 2011. ^ Starr, Cynthia; King, Billie Jean (1988). We Have Come a Long Way: The Story of Women's Tennis. New York: McGraw-Hill. p. 144. ISBN 0-07-034625-9. ^ Hollander, Zander; Collins, Bud (1994). Bud Collins' Modern Encyclopedia of Tennis. Detroit, Michigan: Visible Ink Press. p. 196. ISBN 0-8103-9443-X. ^ Starr, Cynthia; King, Billie Jean (1988). We Have Come a Long Way: The Story of Women's Tennis. New York: McGraw-Hill. p. 145. ISBN 0-07-034625-9. ^ a b c d e Schwartz, Larry. "Billie Jean Won for All Women". Retrieved February 15, 2007. ^ a b c d Deford, Frank (May 19, 1975). "Mrs. Billie Jean King!". Vault.sportsillustrated.cnn.com. Archived from the original on December 9, 2008. Retrieved July 4, 2011. ^ a b Deford, Frank; King, Billie Jean (1982). Billie Jean. New York, N.Y.: Viking. p. 95. ISBN 0-670-47843-1. ^ Lannin, Joanne (1999). Billie Jean King: Tennis Trailblazer. Minneapolis: Lerner Publications Co. p. 99. ISBN 0-8225-4959-X. ^ Brace, Reginald; King, Billie Jean (1981). Play Better Tennis: With Billie Jean King and Reginald Brace. Octopus. p. 16. ISBN 0-7064-1223-0. ^ "Billie Jean King returns to tennis action", The Independent Record, Helena, Montana, March 23, 1977, page 10. ^ "Evert Demolishes Billie Jean". The Gazette. Montreal, Quebec, Canada. June 28, 1977. p. 18. Retrieved August 26, 2017. ^ Lannon, Joanne (1999). Billie Jean King: Tennis Trailblazer. Minneapolis: Lerner Publications Company. p. 101. ISBN 0-8225-4959-X. ^ Radosta, John S. (July 3, 1979). "Tracy Austin Ousts Mrs. King, 6–4, 6–7, 6–2". The New York Times. ^ a b c Amdur, Neil (September 8, 1979). "Injured Mrs. King Is Routed By Mrs. Lloyd in Semifinals". The New York Times. ^ Brace, Reginald; King, Billie Jean (1981). Play Better Tennis: With Billie Jean King and Reginald Brace. Octopus. p. 46. ISBN 0-7064-1223-0. ^ "Navratilova-Lloyd Final". The New York Times. November 25, 1979. ^ "WTA Tournament Archives" (PDF). WTA. Archived from the original (PDF) on April 24, 2016. Retrieved September 23, 2017. ^ Deford, Frank; King, Billie Jean (1982). Billie Jean. New York, N.Y.: Viking. p. 82. ISBN 0-670-47843-1. ^ Lannin, Joanne (1999). Billie Jean King: Tennis Trailblazer. Minneapolis: Lerner Publications Co. p. 103. ISBN 0-8225-4959-X. ^ "Wimbledon Under the Weather". Time. July 12, 1982. Retrieved July 4, 2011. ^ "Billie Jean King retained the $90,000 Edgbaston Women's Tennis..." UPI. UPI. June 12, 1983. ^ Dillman, Lisa (April 27, 2002). "King Dismisses Capriati From Fed Cup". Los Angeles Times. ISSN 0458-3035. Retrieved October 15, 2017. ^ "BJK Firsts and Facts". Billiejeanking.com. August 12, 2009. Archived from the original on March 24, 2010. Retrieved July 4, 2011. ^ a b c d Walsh, David (December 9, 2007) The Big Interview: Billie Jean King. Sunday Times. ^ "Billie Jean King co-founder". Wtt.com. Archived from the original on July 21, 2011. Retrieved July 4, 2011. ^ "Board of Honorary Trustees". Thesportsmuseum.com. Archived from the original on July 17, 2011. Retrieved July 4, 2011. ^ a b c Dwyre, Bill (June 30, 2009). "Billie Jean King is still making team work". Los Angeles Times. ISSN 0458-3035. Retrieved September 23, 2017. ^ "Billie Jean King Elected To Philip Morris Board". Cleanlungs.com. 1999. Retrieved July 4, 2011. ^ a b "Billie Jean King Still Got Game". ABILITY magazine. Retrieved October 22, 2012. ^ "Billie Jean King Remembers 'Battle Of The Sexes'". NPR.org. August 25, 2008. Retrieved October 15, 2017. ^ Pells, Eddie (December 17, 2013). "Obama picks gay athletes for delegation to Sochi Olympics, sending signal on gay rights". Associated Press. Archived from the original on December 19, 2013. ^ "Tennis Great Billie Jean King's Mother Dies in Arizona". February 7, 2014. Retrieved February 8, 2014. ^ "Equality advocate and sports icon to address Class of 2017 – Northwestern Now". news.northwestern.edu. ^ Gurnick, Ken (September 21, 2018). "Addition of King, Kloss sends 'strong message'". MLB.com. Retrieved October 31, 2018. ^ a b Grossfeld, Stan (December 3, 2006). "No royalty like King". The Boston Globe. Retrieved July 4, 2011. ^ "''Sports Illustrated'' honors Wade". Sports Illustrated. December 4, 2006. Retrieved July 4, 2011. ^ "Billie Jean King". The Dynamic Path. Retrieved July 4, 2011. ^ "Weah selected for Arthur Ashe Courage Award". ESPN. Retrieved July 4, 2011. ^ "Chicago Gay and Lesbian Hall of Fame". Archived from the original on October 17, 2015. ^ Murphy, Melissa (April 15, 2006). "Documentary focuses on tennis great Billie Jean King". Sarasota Herald-Tribune. ^ "State unveils Hall of Fame". Orange County Register. August 1, 2017. Retrieved October 9, 2017. ^ "Inductees – California Museum". www.californiamuseum.org. Retrieved October 9, 2017. ^ "Scott Stringer – Manhattan Borough President". Mbpo.org. Archived from the original on July 18, 2011. Retrieved July 4, 2011. ^ Gay, Sheryl (August 12, 2009). "Obama Gives Medal of Freedom to 16 Luminaries". The New York Times. Retrieved July 4, 2011. ^ "Hall Of Fame Southern California". Retrieved October 15, 2017. ^ "National Gay & Lesbian Sports Hall of Fame's Inaugural Class Announced | Out Magazine". Out.com. June 18, 2013. Retrieved December 4, 2013. ^ Friedman, Megan. "Historic Moments in Female Sports – Athletic Women". Marieclaire.com. Retrieved April 16, 2015. ^ "Sports Personality of the Year: Billie Jean King given lifetime achievement award". BBC Sport. December 16, 2018. ^ "Chris Evert: Miss Cool on the Court". Time. August 27, 1973. Retrieved July 4, 2011. ^ Deford, Frank; King, Billie Jean (1982). Billie Jean. New York, N.Y.: Viking. pp. 96–7. ISBN 0-670-47843-1. ^ Kanzenberg, Corry (November 5, 2015). "10 Facts About Charles Schulz, the Creator of the 'Peanuts' Gang". Biography.com. Retrieved October 9, 2017. ^ Kay, Stanley (August 19, 2016). "How Peppermint Patty became an advocate for female athletes". SI.com. Retrieved October 9, 2017. ^ Oxman, Steven (April 11, 2001). "When Billie Beat Bobby". Variety. Retrieved October 9, 2017. ^ "Law & Order – Fallout – Full Cast & Crew". IMDb. Retrieved February 5, 2018. ^ "Billie Jean King". TVGuide.com. Retrieved October 13, 2017. ^ Sage, Alyssa (September 17, 2017). "Emma Stone Imagines a World Where 'Everyone Is Absolutely Equal' at 'Battle of the Sexes' Premiere". Variety. Retrieved September 22, 2017. ^ Leibowitz, Ed (September 2003). "How Billie Jean King Picked Her Outfit for the Battle of the Sexes Match". Smithsonian. Retrieved October 9, 2017. ^ "Billie Jean King of Her Family". Long Beach Press-Telegram. Long Beach, California: Digital First Media. November 23, 1965. p. C-4. ^ a b c Stanley, Alessandra (April 26, 2006). "The Legacy of Billie Jean King, an Athlete Who Demanded Equal Play". The New York Times. Retrieved February 1, 2014. ^ "Billie Jean King, Mother of Modern Sports" (PDF). Imgspeakers.com. Archived from the original (PDF) on September 29, 2011. Retrieved July 4, 2011. ^ "Evert, Navratilova weigh in on tennis legend Billie Jean King". Pittsburghlive.com. Associated Press. April 23, 2006. Archived from the original on April 22, 2009. Retrieved July 4, 2011. Ware, Susan (2011). Game, Set, Match: Billie Jean King and the Revolution in Women's Sports. University of North Carolina Press. Combines biography and history in a study of the tennis player, liberal feminism, and Title IX.